This file photo shows the Twin Towers collapsing on September 11, 2001. The terrorist attacks on September 11, 2001 in the United States were covert operations carried out by Israeli elements in the name of Islam to provoke the US to wage wars against Muslim nations and Israel’s adversaries, experts say. “This was a false flag operation; elements of the US government protected it and the team that carried it out was primarily consisting of agents of Israel,” said Kevin Barrett, an author and 9/11 researcher in Madison, Wisconsin. 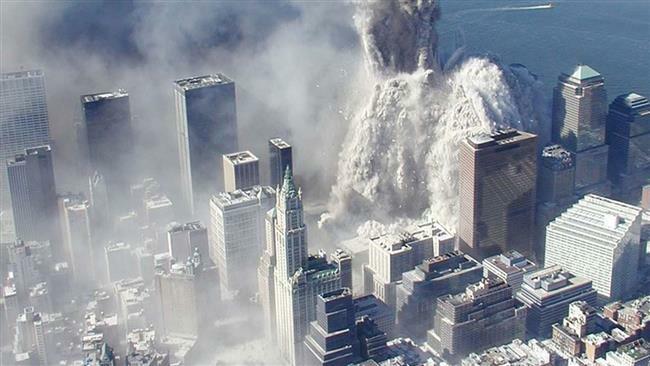 The Twin Towers in New York City were destroyed by “controlled demolitions” and there is no concrete evidence that Muslims hijacked the aircrafts that crashed into the towers, said Barrett, a founding member of the Scientific Panel for the Investigation of 9/11. On Friday, the Al Jazeera news network reported that Saudi Arabia is adding Iran to legal proceedings in the US over its alleged involvement in the September 11 attacks, citing court documents. Lawyers representing Saudi Arabia in a lawsuit that alleges its connection to the attacks filed a “tag-along action” on Wednesday to “consolidate” litigation accusing Iran of also playing a role, the report said. The lawsuit alleges that Iran, Lebanon’s resistance movement Hezbollah, and al-Qaeda formed a committee to oversee joint anti-US attacks. The September 11, 2001 attacks, also known as the 9/11 attacks, were a series of strikes in the US which killed nearly 3,000 people and caused about $10 billion worth of property and infrastructure damage. James Henry Fetzer, a professor at the University of Minnesota who has also conducted extensive research on 9/11, says the attacks were “faked” in various ways and the alleged hijackers later turned out alive after the attacks. US and Israeli intelligence agencies, mainly the CIA and Mossad, carried out the attacks to justify the invasions of Afghanistan and Iraq and advance Western geostrategic interests, Fetzer said. Moreover, Architects & Engineers for 9/11 Truth, a US non-profit organization of architects and engineers, also disputes the results of official investigations into the September 11 attacks, including those by the 9/11 Commission Report.